So, what is on your calendar for December 15? For me, I've already penciled in the night for observing and measuring the magnitude minima for the eclipsing binary star, commonly named Algol. The last post from November 28 described how the visual magnitude would dip from 2.1 to 3.4 for several hours during the eclipse before returning to the normal 2.1, and this happens every 2.87 days. The rest of this post will cover some of the preparatory work going on to get ready to measure the light curve for Algol during the eclipse, but first let's review the calendar for other ongoing activity. First of all, I attended the UCI physics colloquia, that we mentioned last time, and heard a great presentation on sterile neutrinos, although most of it was way over my head. I at least learned that sterile neutrinos are named because they do not experience the weak force as do the other three flavors of neutrinos. Also, while good evidence exists for three neutrinos, the fourth neutrino, the sterile neutrino is still just a concept that has been discussed and kicked around for the last 23 years, but it has not been observed. Experimenters are closing in on the sterile neutrino as a likely candidate for dark matter. Theorists predict that the sterile neutrino could self decay and produce an x-ray line in the range of 2-3 keV. There is growing evidence that this excess x-ray line is seen in clusters of galaxies today, but that more data and evidence that the excess x-rays are not produced by some other more normal astrophysical process. There was much more discussion in the hour lecture but that is about all that I could remember or understand. Some of the regular science squad showed up and it was nice to see Math Whiz, Dave, Science Nerd and Theatre Impresario, Scott, and Flitting between Texas and California, Jay. Good to see you guys! The other upcoming immediate items on the calendar are the free two day workshop on searching for life across space and time at the Beckman Center, all day, Monday and Tuesday and the free UCI Distinctive Voices lecture, also at the Beckman Center, on Wednesday night on the topic of Ocean Worlds of the Outer Solar System. I hope to see you there as all three events should be interesting. Now, finally, let's look at some of the preparatory work involved in getting ready to capture the Algol light curve on December 15. First, I wanted to try to just use my camera and tripod and not go to the bother of setting up the telescope and mount and aligning and all of that stuff. I don't really like to spend a lot of time getting the scope out and setting up and then taking it down and putting it away and it sure would be nice if I could just carry out my camera and tripod and take a quick photo and then just as quick go back inside. So, check out the photo below which shows my new approach to taking quick and easy photos or light curves of visible objects, like Algol. So, for visual observing, the plan is to do some good old fashioned star hopping from known and recognized stars to the final target object. So, after aligning the optical axis of the red dot finder with optical axis of the telephoto lens, using a very bright Venus, we were ready to begin. I didn't spend a lot of time getting this alignment right on, but it turned out to be close enough as can be seen below. I had to get down quite low to see the first star because it was already quite high in the sky and practically had to do the Limbo just to get down low enough. Luckily, Resident Astronomer Peggy came outside with Astronomer Assistants Ruby and Danny and took pity on me and brought out my astronomer chair, which really helped a lot. She already is used to star hopping with her binoculars and she recognized that I was getting all stressed out. Thank you Peggy. I started with Capella, a bright magnitude 0.1 star, then moved up to Mirphak, magnitude 1.8, and then just a short dog leg to the right to Algol. Now in dark skies, these stars would all be quite visible, but here at the observatory, with a lot of light pollution, I had to squint and squirm to find those bright stars. For a while, I sure wished I had my goto scope mount out here and didn't have to find Algol the old fashioned way, but, hey it worked just fine. Of course, it the target object were very dim this technique would not very often be applicable and the goto scope would be a better choice. The photo below shows Algol and some of the background stars. 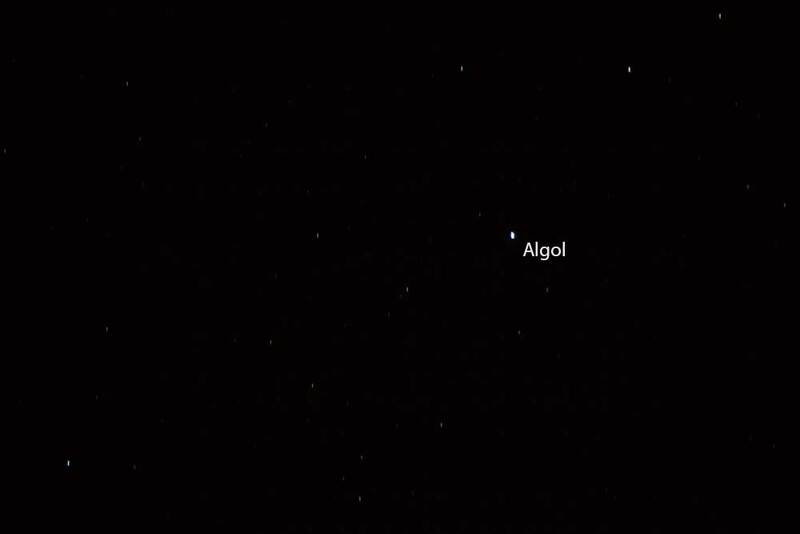 Now since I am not that experienced when it comes to star hopping, so I took this image and uploaded it to Astrometry.net to verify that the field of view indeed included Algol. 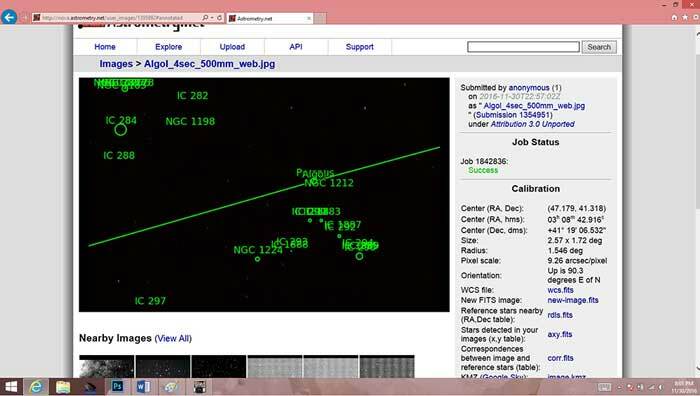 This screenshot from Astrometry.net shows that the above image indeed is just about centered on Algol. The name "Algol" is just barely visible in the screenshot, but the frame center coordinates match up very neatly with the catalog coordinates for Algol. 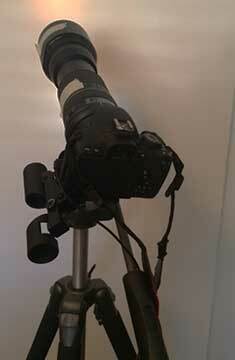 The camera field of view with the 500mm lens setting is about 2.5 by 1.7 degrees. Without the red dot finder to help point out if the target star is in the field of view, it would be very difficult to point the lens at the target star. So, this homework so far verifies that this setup with just a tripod and a red dot finder scope can be used to locate the target object. Now many of you old time amateurs will be saying "of course", but for new amateurs like me who use a computer controlled goto scope, this old but trustworthy technique of star hopping is brand new. Anyway, I learned that I can do it too! The other variable that must be controlled in doing the light curve analysis is selecting the proper exposure time and also correctly for vignetting caused by the telephoto lens. The AIP4WIN screenshot below shows the analysis for a 4 second flat field exposure with the 500mm telephoto lens setting. 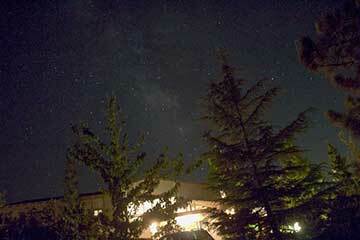 The flat field was taken of the twilight sky which is supposed to represent a uniformly illuminated image. But, one of the first things you should notice is that in the middle window, below, notice how the center of the image appears brighter than do the edges. This is normal effect. Remember that the lens is circular and the camera frame is rectangular and it just works out that the center will be brighter than the edges. Normally this is not critical, but if you were comparing the brightness of a star or object just located in the center of the image with a star located off near one of the edges, you could be misled into judging which star was actually brighter. The bottom window shows how the intensity of the image, across the yellow horizontal line, changes. So, the AIP4WIN software will use this flat image to compensate regardless of where the star image is located. The other thing one should notice is that the image is terribly overexposed. 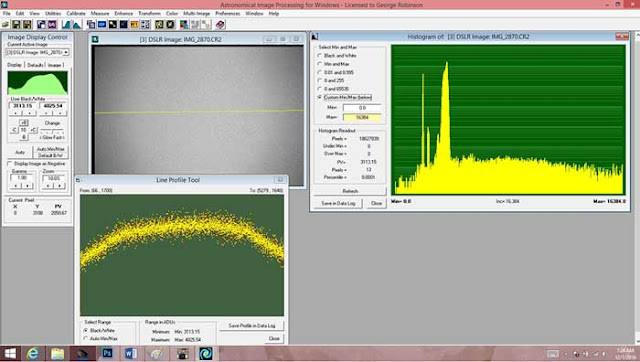 The histogram in the right side window shows the pixel count by light intensity and it is not acceptable to have pixel values as high as 16,000. Now, I only discover this after bringing the camera back inside and doing the computer processing. When I examined the camera histogram it responded primarily to the big peak at the left hand side and I thought that the exposure setting was ok. This is not the case. So, for future image and light curve collection, exposure times of less than 2 seconds are required. I planned to evaluate exposure times of 1 second and 1/2 second to see if I can get good signal to noise ratios, without saturation and still have enough signal when the eclipse occurs and the visible magnitude dips from 2.1 to 3.4. Remember this magnitude change means that only about 1/3 of the amount of light is received compared to normal. Well, as luck would have it, I picked up the tripod and camera and walked outside and setup and got pointed to Capella and ready to star hop my way through Mirphak and on to Algol when the clouds rolled in and blocked out everything. I waited around for about half an hour and then just gave in and went back inside. It just was not going to happen. I would have to wait for the next clear night to check out if 1 second and 1/2 second exposures were going to be acceptable. At least, there are bound to be a couple of clear nights to practice and get ready for the big night on December 15, which we hope will be clear as well.